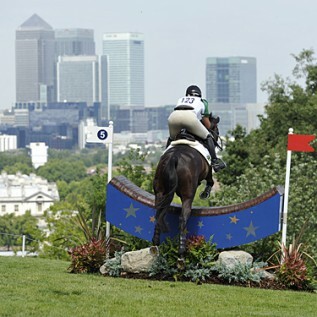 Read all of The Chronicle of the Horse's Eventing coverage of the 2012 Olympic Games. Is there any eventer out there better than Michael Jung? Two clear show jumping rounds at the Olympic Games earned him the individual gold, making him the only event rider to ever hold the title of World Champion, Olympic Champion and European Champion all at once. The Olympic eventing field has narrowed by six after the final horse inspection this morning, and both the U.S. and Canadian squads suffered losses. Sue Benson intended to separate the Olympic winners from the also-rans by making the time tough to get on her twisty, hilly course in the center of Greenwich Park, and the cross-country results proved mission accomplished when Germany’s Ingrid Klimke on Butts Abraxxas tied with Sweden’s Linda Algotsson Ostholt on Wega for first place on double-clear rounds. Find out what happened to all the riders who fell off. No one was more surprised than Yoshiaki Oiwa himself to learn that his score of 38.1 with Noonday de Conde was the best of the day in the dressage portion of the eventing at the Olympic Games. At the end of Day 1, Ingrid Klimke slotted into first place aboard Butts Abraxxas (39.3) ahead of Dirk Schrade in second with (39.8). Eighty-five horses from 22 countries trotted up today, and every horse passed the first inspection, although four were held for re-inspection. Sue Benson has created a masterpiece in Greenwich Park. Enjoying the Chronicle’s Olympic coverage? Consider subscribing and enjoy coverage of equestrian events as only the Chronicle can bring you. Activate your subscription today and receive access to our Olympic Preview issue, as well as three more Olympic issues to come: Eventing Results, Dressage & Show Jumping Results, and Olympic Analysis. Receive 4 free issues and access to all our online premium content: Subscribe Now!